How shall we understand the extensive parallels between the writings attributed to Moroni in the Book of Mormon and passages in the New Testament? In Part 1 of this series we surveyed four major New Testament parallels and over 20 additional shorter parallels in Mormon 8–9 and Moroni 7-10. In this article, we will consider ten aspects of the evidence in this textual material attributed to Moroni that reveals that its author was very familiar with the New Testament and freely and extensively drew on it. The Book of Mormon was dictated by Joseph Smith to his scribes in 1829 and (mainly) 1829 and then published in 1830. Other than internal statements within the Book of Mormon asserting its antiquity, there is no known reference to its existence prior to the late 1820s. The gold plates on which it was supposedly written were also unknown prior to the 1820s; they were unreadable by anyone at the time (even by Joseph Smith, who did not even look at the plates when dictating his translation), were never available for public viewing or scholarly examination, and have not been seen by anyone on earth since 1829. Within this book we find extensive parallels to the New Testament that typically follow closely the wording of the King James Version (KJV) published in 1611, the Bible that Joseph Smith read and knew. These facts are the basis for an eminently reasonable presumption that the parallels to the New Testament in the Book of Mormon reflect its modern origin in the 1820s. The burden of proof in this situation is on anyone who would argue that the Book of Mormon was not literarily dependent on the KJV New Testament. 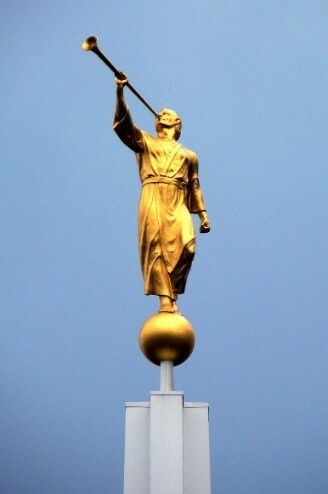 It is somewhat plausible, given belief in the antiquity of the Book of Mormon, to suppose that Moroni might occasionally have said something similar to a statement made by Paul or James and that Joseph Smith was inspired to express that similar idea using the familiar wording of the KJV New Testament. This is really the only way to account for any such parallels. However, the larger the number of passages in the Book of Mormon that parallel the New Testament, the more strained such an explanation becomes. The sheer large number of passages in Mormon 8–9 and Moroni 7–10 that parallel passages in the New Testament—over two dozen—are most easily and naturally explained by concluding that the author of those sections of the Book of Mormon used the New Testament. The fact that the parallels come from all over the New Testament is very difficult to explain unless the author of the books of Mormon and Moroni was very familiar with the New Testament. As noted above, just in the six Book of Mormon chapters under consideration there are parallels to twelve different New Testament books from every part of the New Testament canon. The larger the two bodies of literature one compares, the more accidental the verbal parallels one might discover between them are likely to be. Naturally, if we were to compare hundreds of ancient texts from one part of the world with hundreds of ancient texts from another part, we would not be surprised to find several or even many similar ideas expressed in similar ways. The smaller the body of texts being compared and the more numerous the parallels, the less plausible it is that the parallels are accidental and the more likely it is that one source has borrowed from the other.1 In this case, we have what purport to be two fairly short texts written by the same ancient figure (Moroni) that contain over two dozen parallels to the New Testament, itself a modestly sized collection of texts. There are simply too many of these parallels in too short a span of text to be explained in any way other than literary dependence. These parallels are especially densely clustered toward the end of Moroni’s addendum to the short Book of Mormon, where 15 different New Testament texts are paralleled in the span of only about 2,300 words (Mormon 8:17–9:28). Hypothetically, if in Moroni’s writings we found one seemingly random parallel to a passage in the Gospel of Matthew, such an isolated parallel might not constitute compelling proof of literary dependence of Moroni on Matthew. However, the presence of multiple parallels to Matthew is another matter. In Mormon 8–9 and Moroni 7–10, we find six parallels to statements in as many different chapters of Matthew spanning nearly the entire book. Twice in the writings attributed to Moroni, we find multiple parallels to widely separate statements in Matthew in a short span of text. In Mormon, we find three parallels to Matthew (5:22; 3:10 or 7:19; and 24:6-7) in the span of just 14 verses (Mormon 8:17, 21, 30). In Moroni, we find two parallels to Matthew (7:2; 21:22) in the span of just 9 verses (Moroni 7:18, 26). One could, admittedly, object that Moroni knew of some of these statements because they were preserved in the Book of Mormon’s version of the Sermon on the Mount (Matt. 5:22; 7:2, 19). Yet this supposition (which has its own problems) cannot explain the occurrence of three additional parallels to the Gospel of Matthew outside the Sermon on the Mount (Matt. 9:12-13; 21:22; 24:6-7). When one considers all of these pieces of evidence together, they form the basis of a strong cumulative case for literary dependence of the text on Matthew as a book. Matthew is not the only New Testament writing paralleled multiple times in close proximity within the Moroni texts. Mormon 9, in the span of just 9 verses, contains parallels to statements in three different chapters of the Book of Revelation (Mormon 9:6, see Rev. 7:14; Mormon 9:13, see Rev. 20:12; Mormon 9:14, see Rev. 22:11). In addition, there are several examples of multiple parallels to the same New Testament book but not in close proximity within the Book of Mormon. For example, there are multiple parallels to the Gospel of John (1:29, 36; 15:7, 16; cf. Mormon 9:3; Moroni 7:26) and Romans (4:3; 12:19; cf. Moroni 7:7; Mormon 8:20). Mormon 8–9 and Moroni 7–10 contain three instances of parallels to pairs of passages that happen to be in adjacent chapters of the New Testament. There are parallels to 1 Corinthians 12 and 13, to 1 John 3 and 4, and to Hebrews 13 and James 1. We noted earlier the fact that the Book of Moroni contains substantial parallels to 1 Corinthians 13:4-8a (in Moroni 7:44b-47) and 1 Corinthians 12:4-11 (in Moroni 10:8-17). The two passages in Moroni have less than three chapters of text intervening between them, and of course the two passages in 1 Corinthians are less than a chapter apart (with only about 21 verses, or about 450 words, intervening between them). What makes this pair of parallels so noteworthy is that both passages in Moroni exhibit lengthy, substantial parallels to the two passages in 1 Corinthians. We also drew attention earlier to the substantial parallel between 1 John 3:1-3 and Moroni 7:48. Another, lesser though still meaningful parallel appears in Moroni 8:16b, which contains a clear parallel to 1 John 4:17-18a. The proximity of these two parallels appearing in the same order in both books provides strong confirmation that the author of the Book of Moroni was familiar with the epistle of 1 John. In each of the ten passages listed above, the Book of Mormon text contains parallels both to one or more statements in the Gospels and to one or more statements from the New Testament epistles (and occasionally also to statements from Acts or Revelation). Similarly, we find clusters of parallels to both Gospel and epistle texts in Mormon 8 and 9 and in Moroni 7 and 8 (though not in Moroni 10). What this pattern of clustering of New Testament parallels suggests is that on multiple occasions, the author of the Book of Mormon drew heavily on his knowledge of the New Testament, often though not always combining statements from the Gospels and from the other parts of the New Testament. That is to say, the most natural and cogent explanation for this evidence is that the Book of Mormon has a single author, not multiple authors, and that this single author was familiar with the New Testament as a whole. Many New Testament statements have parallels in multiple places in the Book of Mormon, even in books that present themselves as having been written by different authors. Hebrews 13:8, for example, has seven parallels in texts attributed to all three of the major Book of Mormon authors—Nephi, Mormon, and Moroni. Below are listed five New Testament texts with clear parallels in the Moroni material as well as one or more passages attributed to other Book of Mormon authors. “and he that believeth and is baptized, shall be saved, but he that believeth not, shall be damned” (Mark 16:16). “…and whoso believeth in me, and is baptized, the same shall be saved; and they are they which shall inherit the kingdom of God. And whoso believeth not in me, and is not baptized, shall be damned” (3 Nephi 11:33-34). “For he that believeth, and is baptized, shall be saved; but he that believeth not, shall be damned” (Ether 4:18). “…and he that believeth and is baptized, shall be saved, but he that believeth not, shall be damned” (Mormon 9:23). “thou art in the gall of bitterness, and in the bond of iniquity” (Acts 8:23). “And now as ye have been delivered…also from the bonds of iniquity” (Mosiah 23:13). “My soul hath been redeemed from the gall of bitterness and bonds of iniquity” (Mosiah 27:29). “O Jesus, thou Son of God, have mercy on me, who art in the gall of bitterness” (Alma 36:18). “All men that are in a state of nature, or I would say, in a carnal state, are in the gall of bitterness, and in the bonds of iniquity” (Alma 41:11). “But wo unto such, for they are in the gall of bitterness, and in the bonds of iniquity” (Mormon 8:31). “He that supposeth that little children needeth baptism, is in the gall of bitterness, and in the bonds of iniquity” (Moroni 8:14). “…work out your own salvation with fear and trembling” (Phil. 2:12). “And now my beloved brethren, I desire that…ye should work out your salvation with fear before God” (Alma 34:37). “…work out your own salvation with fear and trembling before him” (Mormon 9:27). “Jesus Christ the same yesterday, and to day, and for ever” (Heb. 13:8). “For he is the same yesterday, to-day, and forever” (1 Nephi 10:18). “For the spirit is the same, yesterday, to-day, and forever” (2 Nephi 2:4). “I will shew unto the world that I am the same yesterday, to-day, and forever” (2 Nephi 27:23). “I am the same yesterday, to-day, and forever” (2 Nephi 29:9). “But thou art the same, yesterday, to-day, and forever” (2 Nephi 31:17). “For do we not read that God is the same yesterday, to-day, and forever” (Mormon 9:9). “He [Christ] is the same yesterday, to-day, and forever” (Moroni 10:19). “…and the elements shall melt with fervent heat” (2 Peter 3:10, 12). “…even until the elements should melt with fervent heat” (3 Nephi 26:3). “…and the elements shall melt with fervent heat” (Mormon 9:2). Here again, this line of evidence strongly supports the conclusion that the same author is responsible for these multiple allusions to the New Testament. So far, we have found multiple lines of evidence from New Testament parallels showing that a single author produced the Book of Mormon, including the writings attributed to Moroni, and that this author knew and used the New Testament. In what follows, we will consider two lines of evidence that show that the author of the Book of Mormon was a modern, English-speaking person living in the late eighteenth or early nineteenth century. For the purposes of identifying most if not all of the likely meaningful parallels between Moroni’s writings and the New Testament, we have included all qualifying examples in which there is a sequence of at least five words identical in both books (including variant grammatical forms of the same word, such as you and thee), using the KJV as the New Testament text. By this standard, there are well over a hundred4 of such New Testament parallels in the Book of Mormon, including more than two dozen in Mormon 8–9 and Moroni 7–10 alone. The preceding seven considerations have demonstrated the dependence of the Book of Mormon on the New Testament, both with regard to its dependence on many of the individual books in the New Testament and on its compilation as a canonical collection. Although verbal parallels to the KJV have been used to demonstrate this dependence, the above seven lines of evidence do not necessarily prove dependence specifically on the KJV. One might maintain that in a short statement or clause of as few as five words, the fact that the wording in the Book of Mormon happens to match the wording of the KJV is not necessarily surprising. One might reasonably suggest, for example, that the statement “Behold the Lamb of God” need not be dependent specifically on the KJV—though it would still be clearly dependent on the Gospel of John. However, this reasonable point will not cover all of the evidence. There are many places in the Book of Mormon where the verbal parallels to the KJV far exceed a simple five-word sequence. The most striking example is in 3 Nephi 14:1b-27, in which 593 of the 595 words of Matthew 7:1-27 in the KJV (99.7%) are found verbatim. The only differences are the addition of unto in 3 Nephi 14:7 and the use of whoso instead of whosoever in 3 Nephi 14:24. Although the verbal parallels to the KJV text of the Sermon on the Mount are the most obvious and (to be frank) undeniable examples of the specific use of the KJV in the Book of Mormon, there are many other notable examples. There are at least 29 different passages in the Book of Mormon with at least one word string of 10 or more words that are verbatim parallels to New Testament passages in the KJV. In these passages, the identical word sequences are twice as long (or more) as the minimal five-word sequence we have been using. Seven of these 29 passages are in the six chapters attributed to Moroni that is the focus of our study (Mormon 8–9 and Moroni 7–10). Five Book of Mormon passages include word strings of more than 20 words each that are verbally identical to New Testament passages in the KJV. In order of the length of shared word strings, these passages are Mormon 9:22b-24 (80 words), 3 Nephi 20:23-27a (47 words), Moroni 7:44b-47 (32 words), Alma 5:51-52 (26 words), and Ether 4:18 (24 words). These are not the only passages in the Book of Mormon that display definite literary dependence on the KJV, but these are sufficient to make the point. Even a single meaningful ten-word sequence is generally good evidence for direct verbal dependence; more than two dozen such sequences, including a passage of nearly 600 words with a difference of only two words, settles the matter definitively. We may now conclude that the Book of Mormon, including Moroni’s writings, are dependent on the New Testament as a canonical collection of writings and that this dependence is specifically in relation to the KJV. Moreover, we have shown evidence to conclude that the author of Moroni’s writings is the same author as the one responsible for the rest of the Book of Mormon: we find the same clustering of multiple parallels to multiple New Testament texts in all parts of the Book of Mormon, and we find certain apparently favorite New Testament sayings (especially Acts 8:23 and Hebrews 13:8) used repeatedly in various places in the Book of Mormon. If the author of the Book of Mormon used the KJV, then he must have done so after its initial publication in 1611 and no later than 1829, when Joseph Smith dictated the English text of the Book of Mormon to his scribes. The last line of evidence we will consider narrows the timeframe further to the late eighteenth or early nineteenth century—the period when Joseph Smith lived. The New Testament textual materials used in Moroni’s writings (as in the rest of the Book of Mormon) are employed in the service of addressing various issues current in Joseph Smith’s immediate cultural context. The totality of the Book of Mormon’s use of the Bible leads to this conclusion; here we will just briefly give a couple of examples. A major theme of the Book of Mormon, especially of the writings attributed to Moroni, is that future professing Christians would falsely claim that God no longer does miracles, in effect denying God’s power or will to manifest and reveal himself miraculously. This was a common issue in Joseph Smith’s time and culture. The British scholar Richard Wright, in a book published in 1816, referred to the apostolic era as “the age of miracles” and commented, “Miracles were necessary at the introduction of a new dispensation; that necessity has long since ceased.”5 Wright and other authors in the late eighteenth and nineteenth centuries commonly made this point in response to skeptics who rejected the biblical miracles on the grounds that such events were not in evidence in the modern era. They reasoned that if God wasn’t doing such miracles in their era then there was no reason to believe he was a miracle-working God at all. This was not a serious issue in the seventeenth century, when the KJV was published. It became an increasingly pressing and disputed issue in the years following the publication in 1748 of David Hume’s book An Enquiry Concerning Human Understanding, a chapter of which set forth the most famous and influential philosophical case against the credibility of belief in miracles. It was largely Hume’s work that led to the flourishing of skepticism regarding miracles among many people in the early nineteenth century. However one explains it, the Book of Mormon presents both Nephi and Moroni, roughly a thousand years apart, responding to a distinctively modern issue about whether God still does miracles, and apparently drawing on the New Testament book of Hebrews (which was centuries away from being written when Nephi would have been alive) to support their argument. Frankly, the idea that Mormon would have been so vexed at Christian Nephites in the late fourth century AD over the matter of baptizing infants is not credible. Three considerations raise grave doubts about the plausibility of this part of the Book of Mormon narrative. First, let us assume (as the Book of Mormon does) for the sake of discussion that infant baptism was a departure from the apostolic practice.7 If so, it seems highly coincidental that the practice of baptizing infants would have developed among the Nephites just as it did in the early postapostolic church in the Old World. Second, it seems especially unlikely that Nephite Christians would have thought baptism was necessary for the salvation of infants, a claim against which Mormon inveighs. It does not seem likely that this belief would have gotten a serious foothold among Nephite Christians, since the earlier Nephite scripture of the Book of Mosiah explicitly taught that little children were under no threat of judgment but were all assured of eternal life (Mosiah 3:16, 21; 15:25). Third, it would be extremely odd for Mormon to have been especially troubled by the practice of infant baptism given the occultism, violence, and general hardness of heart and wickedness that the Book of Mormon presents Mormon as saying characterized the Nephite people in their supposed final days (see Mormon 1:19; 2:8, 15, 18-19; 3:9-15; 4:10-12). In such a degenerate culture, with the Nephite civilization and church crumbling in rank apostasy and wickedness, it would be strange for Mormon to have devoted an entire epistle to condemning the belief and practice of baptizing little children. When one takes into account the sheer implausibility of the Book of Mormon’s presentation of Mormon and Moroni addressing such issues as the continuation of miracles and the practice of infant baptism in their writings along with the fact that their writings address those issues with allusions to various New Testament passages (in the KJV), the conclusion is all but inescapable that the real author of Moroni’s writings was a modern English-speaking individual living in the late eighteenth or early nineteenth century. The obvious and most likely suspect, given the appearance of the Book of Mormon for the first time in 1829 and 1830, is Joseph Smith. 1. Technically, there is a third option: Both sets of texts may be indebted to a common source or group of sources. However, this hypothesis also becomes strained if the parallels are too many and too closely clustered together. 2. Additional considerations confirming this conclusion about Mormon 9:9 will be presented in a subsequent article in this series. 3. I estimate that there are clear New Testament parallels in at least 88 of the 239 chapters of the Book of Mormon. 4. By my calculation, at least 130, probably more. 5. Richard Wright, An Essay on Miracles (Liverpool: F. B. Wright, 1816), 11. 6. We did not count the likely allusion to 1 Corinthians 13:13 in Moroni 8:14 in our initial survey of New Testament parallels in Moroni’s writings. However, since there is an undeniable parallel to 1 Corinthians 13:4-8 in the previous chapter (Moroni 7:44b-47), there is no reason not to recognize the brief though clearly meaningful allusion to 1 Corinthians 13:13 here (see Moroni 7:1; also Alma 7:24; Ether 12:28). 7. A majority of the world’s Christians, of course, disagree, believing that infant baptism is consistent with the teachings of the apostles. From their perspective, the Book of Mormon’s denunciation of the practice is not only anachronistic but simply wrong. On the other hand, many evangelical Christians agree with Mormonism in rejecting infant baptism, as did many evangelicals (especially the Baptists) in Joseph Smith’s day.